Designation: Research Fellow, Centre For Policy Analysis, New Delhi. The book has compendium of research papers written by scholars who are drawn from different disciplines such as Sociology, development studies, International studies, Anthropologists and so on. The eight research papers are based on ethnography, case studies and narratives of the immigrants which are drawn from different geographical terrains of the world, but mainly focusing on immigrants from Latin American countries to Europe or U.S.A. The editor of the book starts with an introduction in which he says that the broad geographical outlook allows for a broader analysis of Diaspora formation, production of transnational social space, and the determinants of trans-national engagements. He further adds that the possible positive and negative influences of such engagements on developing the countries or local communities within them are documented in the following eight chapters. 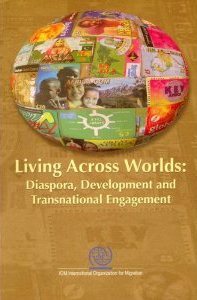 The first chapter discusses about contemporary defini-tions and conceptualizations of Diaspora. It has been ar-gued that Diaspora does not emerge solely as a conse-quence of dispersion, common national ancestry, or simp-ly any kind of connection. There is a process by which groups are motivated or influenced to become Diasporas. The author argues that the following criteria are essential such as- the level of community consciousness about the needs for a link with the homeland; whether the home-land government is encouraging diasporic identifications or links; the perception of emigrants by the society in the homeland and finally the relationship between homeland and host governments. Such processes are demonstrated by using case studies of the different Central American migrant groups. Finally, one can infer that the ‗context‘ is important apart from common origin and history for a migrant group to emerge as a diaspora. The second chapter approaches the production of trans-national social space through Henri Lefebre‘s (1991) dis-tinction between space as practiced, conceived and per-ceived. The author uses Mexican migration of 1910s to 1940s to the United States as a case study to theorize the production of transnational social space. The third chap-ter sets out to analyze the contradictory processes of the making and unmaking of transnational communities and diasporic identities. The author challenges the conven-tional concepts of diaspora and transnational community by using Burundian diaspora in Belgium as a case study. The author shows that the objective position of a diaspo-ra in the host country is not only born out of ethnicity and time of arrival, but also depends on individual politi-cal maneuvering in the transnational political field shapes diasporic networks and determines the contents of trans-national practices. The fourth chapter maps and exam-ines the determinants of transnational engagements among Nicaraguan migrants in Costa Rica. It is demon-strated that Diaspora as platform for politics as well as location of change. The chapter further shows the evi-dence of a new transnational political field of action that has to be taken into account in the current political land-scape. The fifth chapter discusses about the transnational en-gagement of ‗return Diaspora‘ in the homeland with the help of case study of Somali Diaspora and shows the pro-cess of ‗getting local‘ as well as about recognition, power relations, opportunities, nation building and gender in the homeland. The sixth chapter challenges the notion of ‗return‘ as a migratory practice and develops the concept of ‗revolving returnees‘ to capture the dynamics between an ideology of return and final homecomings on the one side, and mobile migratory practice on the other. The chapter also explains why ‗revolving returnees‘ maintain continued forms of mobility between Somaliland and the West, and concludes that people need networks, knowledge, money and documents to be able to ‗circulate‘ between Somaliland and the West. The chapter also tells you that the Somalis are prime example of what Roger Rouse called a ‗transnational migrant circuit‘ that is maintained through the circulation of people, money, goods and information (Rouse, 1991:15). The seventh chapter analyzes transnational family life among Latin American migrants in Europe. The chapter criticizes that the previous studies tend to look at trans-national migration as larger processes of cross-border family relations, but have largely failed to address more closely micro-social processes-such as family formation and family transformation-beyond the simple description of continuous connections across borders. The article ar-gues that one has to go beyond ‗methodological national-ism‘ (Wimmer and Glick Schiller, 2003) which should be substituted with ‗methodological regionalism‘ (page no: 169). The final eighth chapter explains the migration ex-periences of Peruvians. It argues that the decisions to emigrate as well as the choice of destination countries are determined by migrant‘s previous migratory experi-ence and economic and social status in Peruvian society. It has been argued that migrants construct different no-tions of home in response to the context of reception in their new settings as well as their previous migration ex-perience. The chapter cautions that the policy makers should take into account the dynamics of migratory expe-riences while framing the policy. In the conclusion, it has an overview of all the research papers and gives food for thoughts for policy makers and practitioners to engage with Diaspora effectively. The main criticism of the book is that every research pa-pers is intercepted with abstracts of the research papers which are not necessary, because there are abstracts of each chapter in the introduction section itself. Further, the authors of each chapter, while discussing about trans-national engagements with the homeland, they should have made a comparison or reference to Indian or Chi-nese diaspora who are well- known engaged diasporas with the homeland. The other major criticism could be that though the authors of each chapter from different discipline, they have not used much of their respective discipline‘s concepts. All of them focus on the concepts namely development and transnationalism, of course, the concepts like social capital and cultural capital have been used in the fifth chapter for analysis. None of the re-search papers discusses about macro level impact on a nation state. Instead, all of them focus on micro level impact on community, region or family. Further, none of the research papers provide any kind of statistical data or details about the remittance to homeland. Of course, it is a qualitative analysis, but, it could have been better if there had been quantitative analysis while discussing about remittance flow at least in the first chapter. Over all, it can be said that it is a value addition in the growing body of Diaspora literature and scholarship.